Foundry Form was released in Spring 1999. Conceived as a sans and serif family, both versions were drawn concurrently. Capital and x-height proportions match in Foundry Form Sans and Serif to allow them to work together harmoniously, yet each family can function independently. The horizontal emphasis of Foundry Form gives it a powerful lateral dynamic, ideal for screen use. The proportions of the typeface are slightly condensed making it very economic with space. The fonts are extremely legible at small sizes due to the open internal shapes of the characters. Foundry Form Sans is a modern humanistic sans. Foundry Form Serif has a more refined contrast between thick and thin strokes, and has a true italic. Foundry Form Serif works well on low grade papers; its sharp serifs and angularity retain maximum clarity. Each weight has three sets; two main character sets, one containing aligning figures, the other old style figures for book text; the third set contains small capitals and old style figures. Foundry Form was my attempt to make a typeface with as maximum horizontal axis as possible, hence the very shallow connecting strokes which features prominently in such letters as the lowercase a, b, d, g, h, h, m, n, p, q and u. Also the terminal strokes of the c, e, f, g, j, r, s, t, finish at a sharp near horizontal angle. The whole alphabet tries to appear as a series of short low waves flowing in a strong direction to the right. 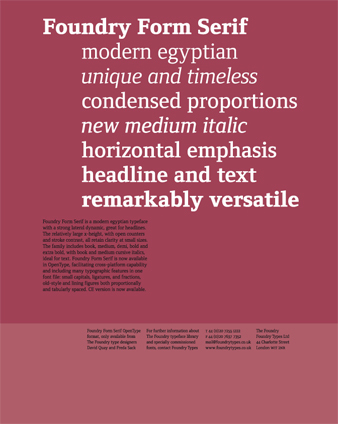 The typeface was conceived from the beginning as both a serif and sans serif family. The sans serif is more successful than the serif version being stronger and more vigorous; maybe in the future the serif version will be reworked.